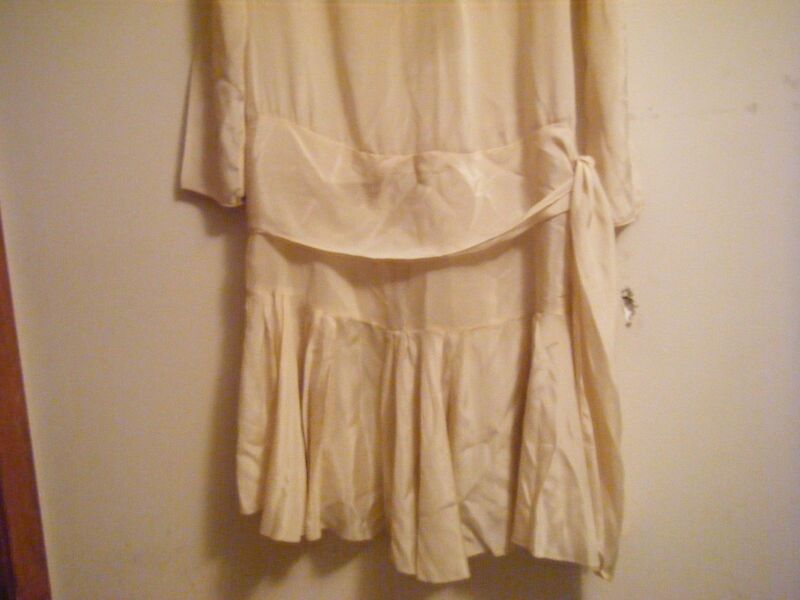 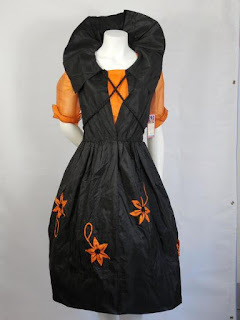 This is a vintage taffeta and organza 1920's 1930's woman's Halloween witch costume. 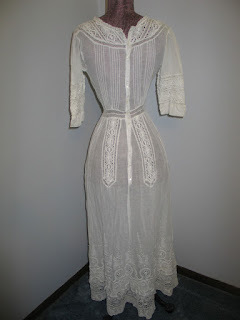 It is amazing and in such beautiful condition. 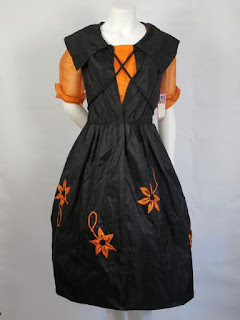 These costumes are quite rare and so very hard to find. 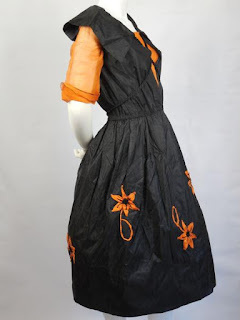 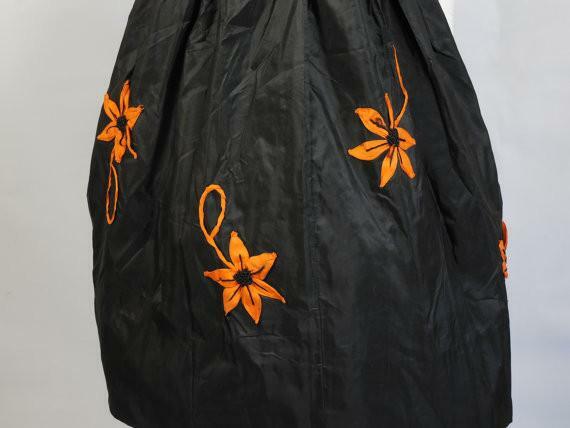 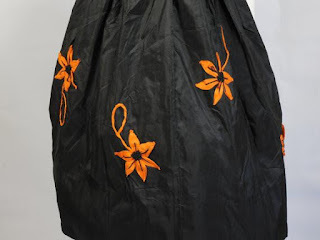 This dress consist of black taffeta which is embellished with organza orange flowers around the skirt, full collar that can be worn up or down and a silk rope that crosses the bust line and ties at the back of the waist. 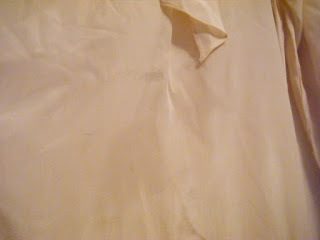 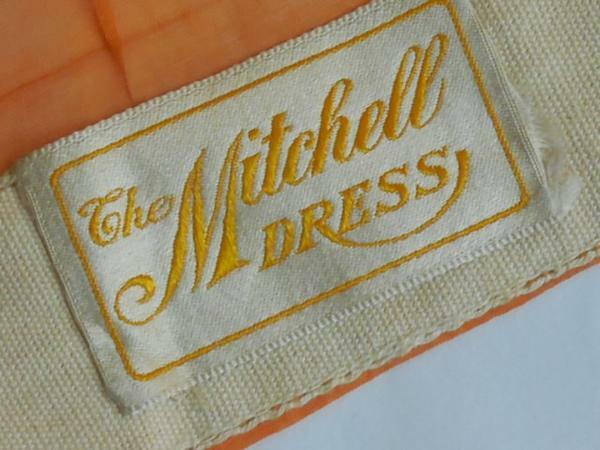 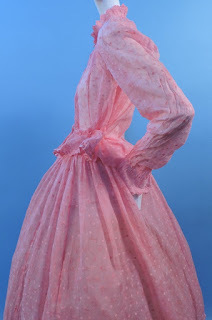 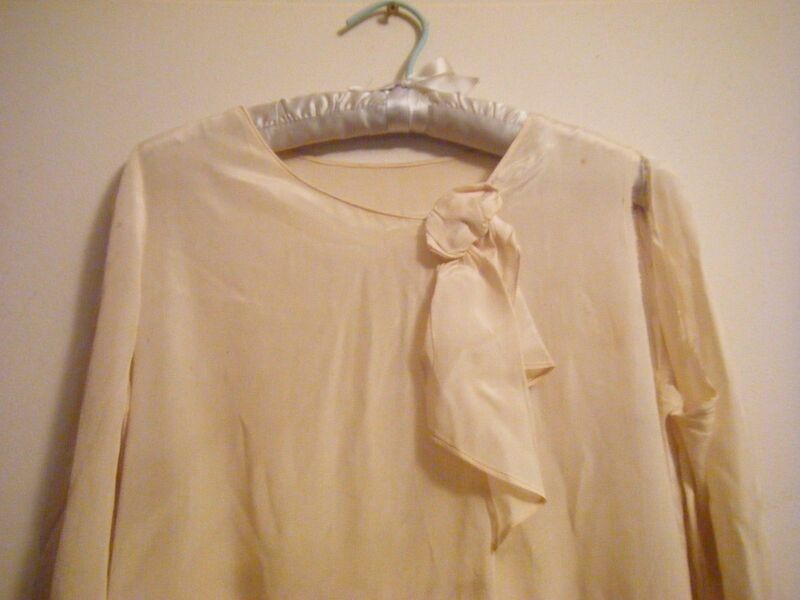 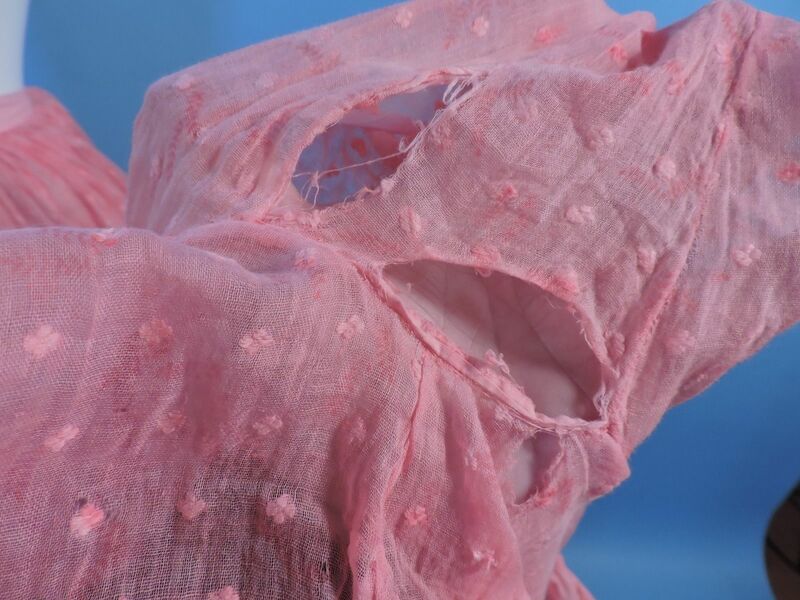 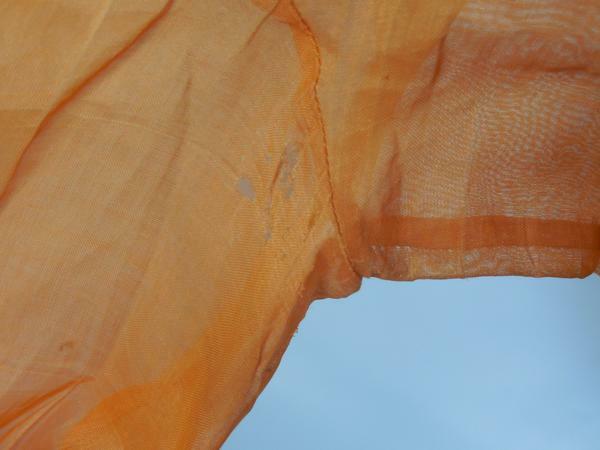 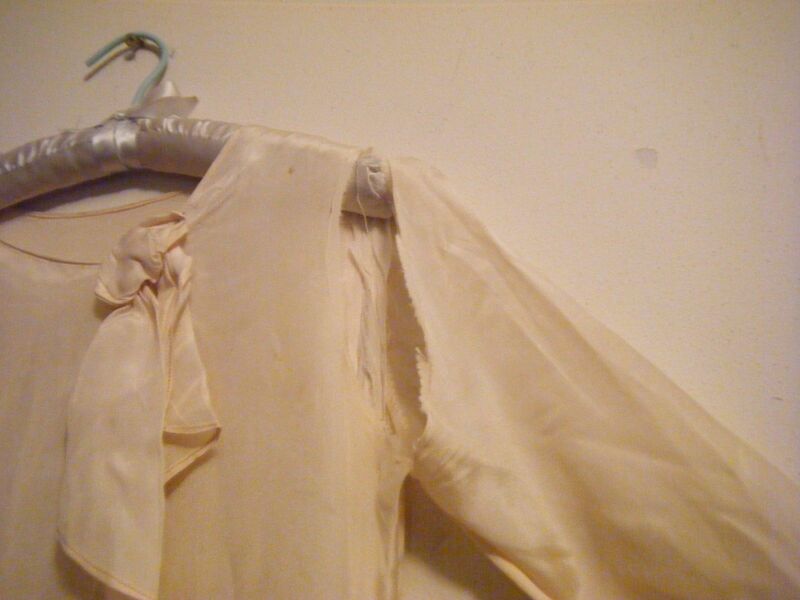 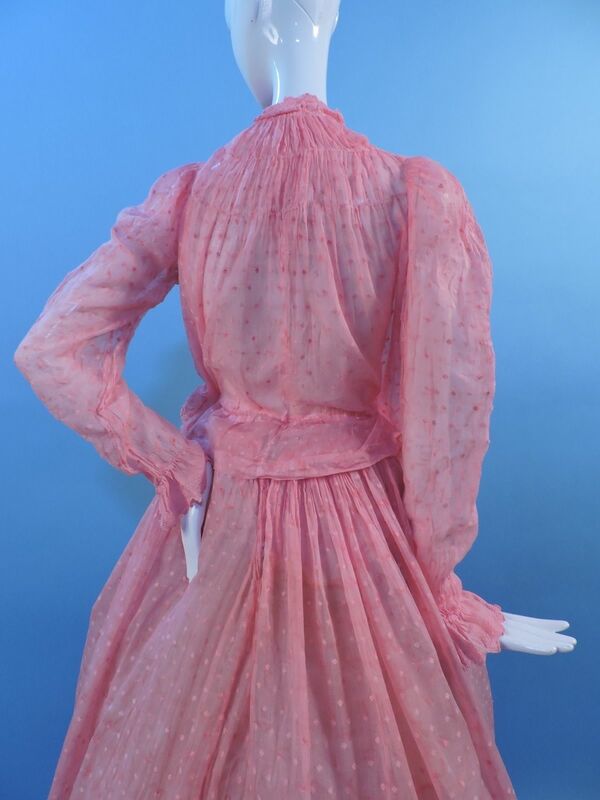 The underlining is the blouse of orange organza fabric which closes with eye hooks and snaps. 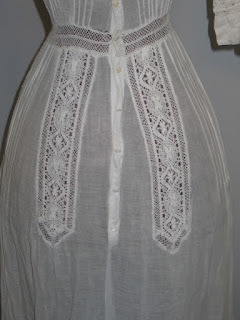 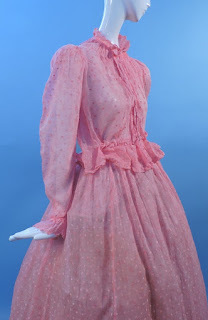 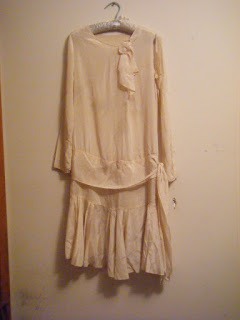 There is a long bib type tail that hangs down the front from the blouse. I am not quite sure how this attaches to the rest of the dress but it doesn't take away from the look or how the dress fits. Condition: I would have to say good to excellent. 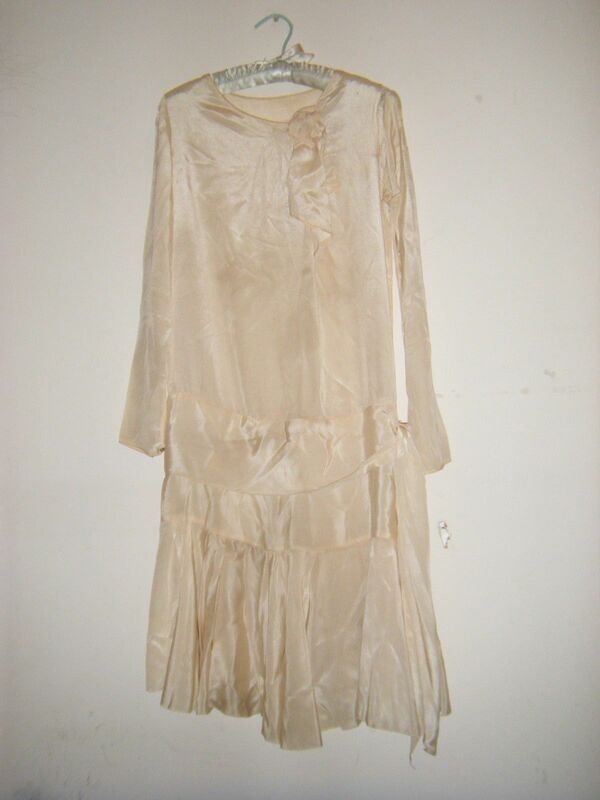 The dress is definitely in wearable condition. 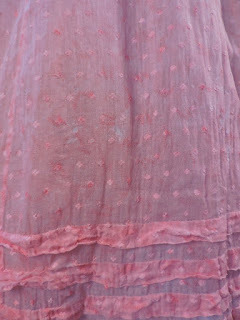 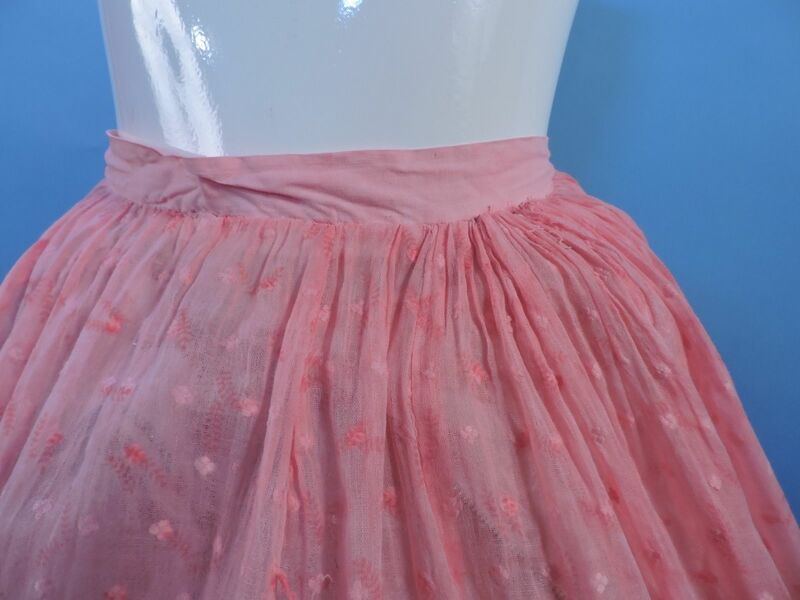 There are a few pin hole spots here and there on the taffeta but not noticeable unless you are looking for them. 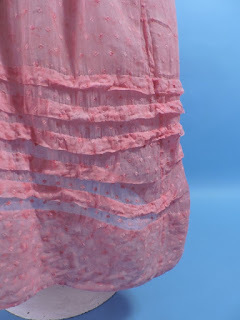 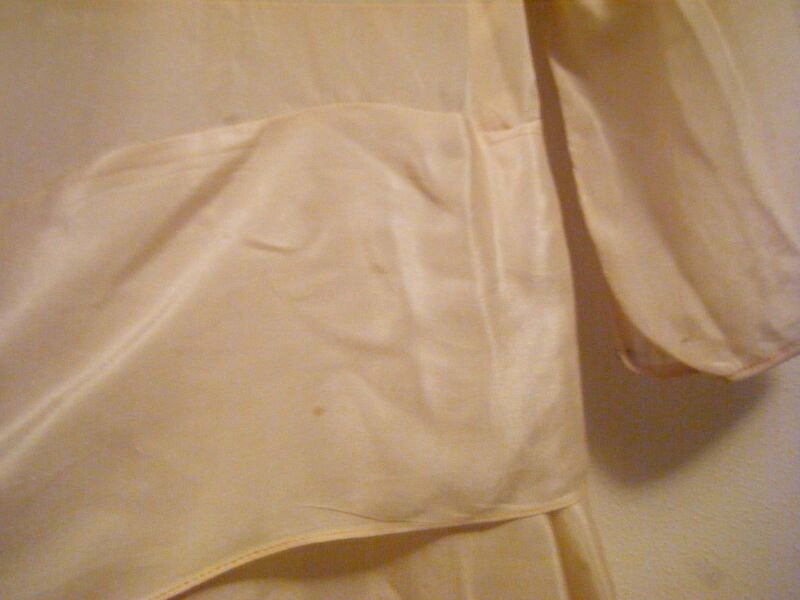 The organza is in amazing condition with only one area that I can see, which is under the left armpit where I see some fabric separation. (view photo) This is a very small area and I believe can be reinforced. 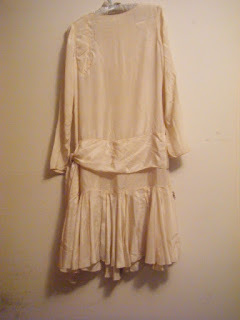 Other than that this costume dress is in amazing condition for it's age and again quite a rare find. 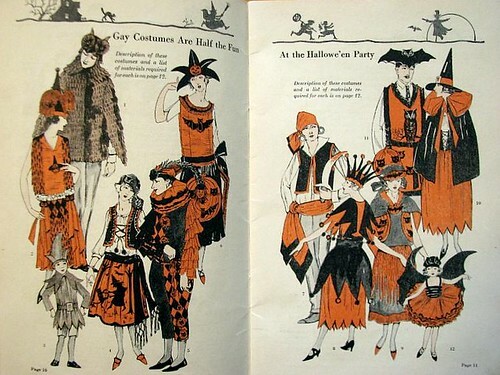 I've been obsessed with 1920's Halloween costumes lately. 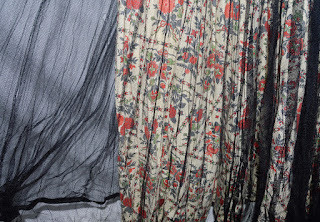 They are either just too cute or just too weird to our eyes. 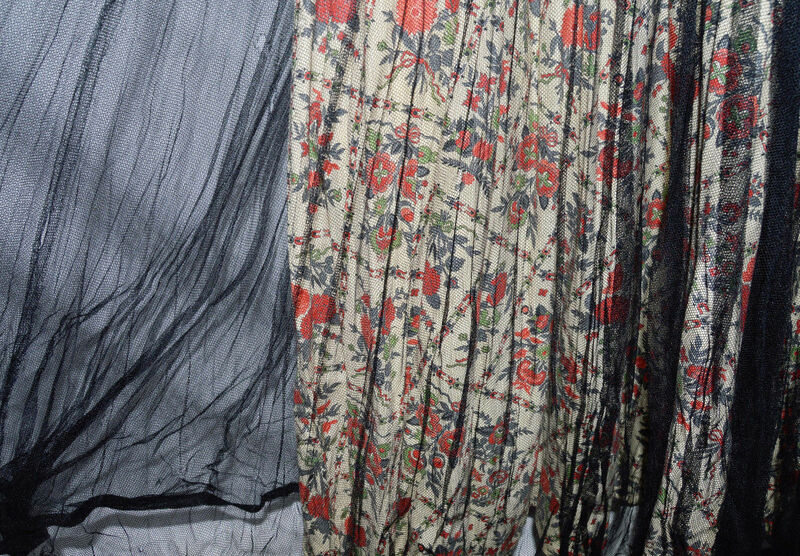 I hope everyone had a frightfully delightful Halloween - I had to go to class (grad school) so I didn't get to do much more than dress up today. In very good preowned condition. 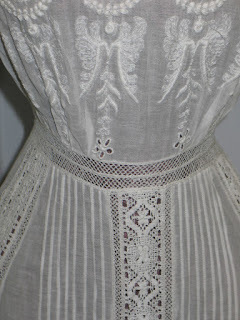 Bust 32-33, waist 26, hip free. We take returns if not satisfied. 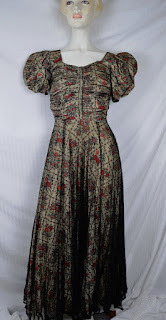 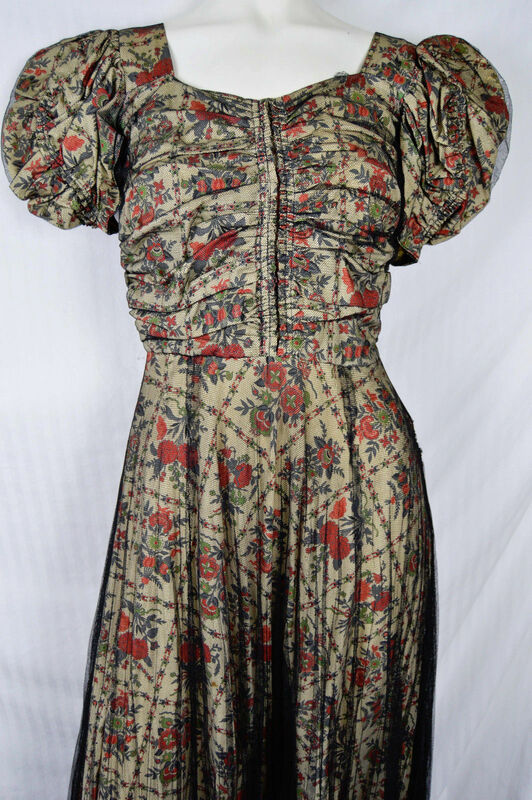 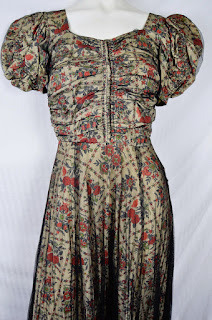 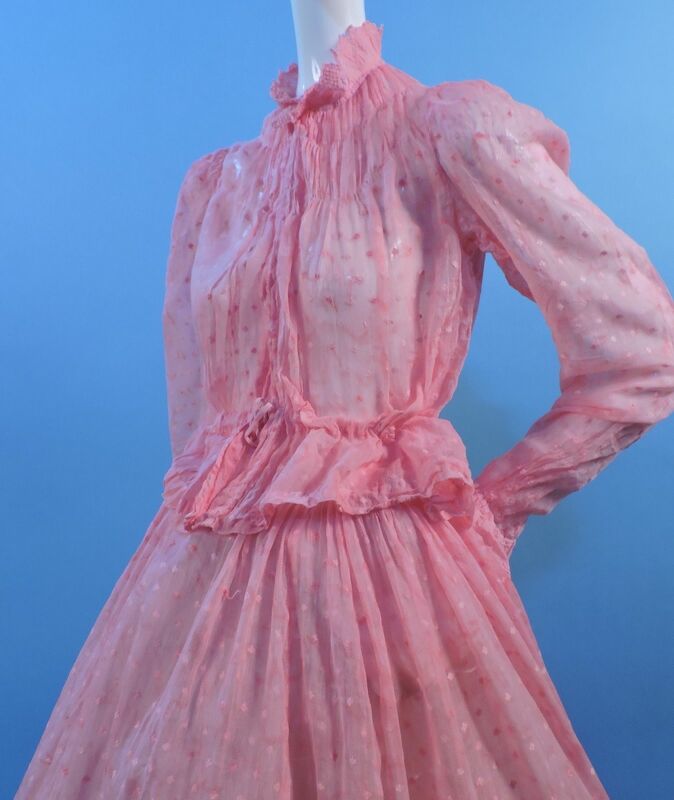 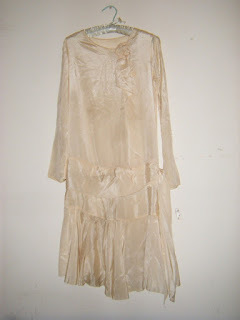 This dress is from the 1938/1939 time frame. 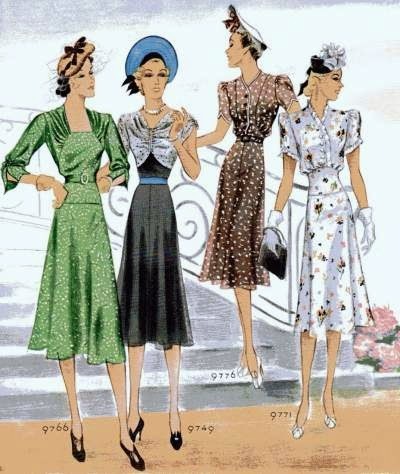 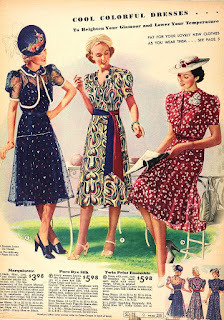 The ruching down the front is similar to the second from the left in the 1938 fashion plate. 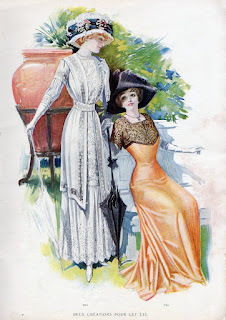 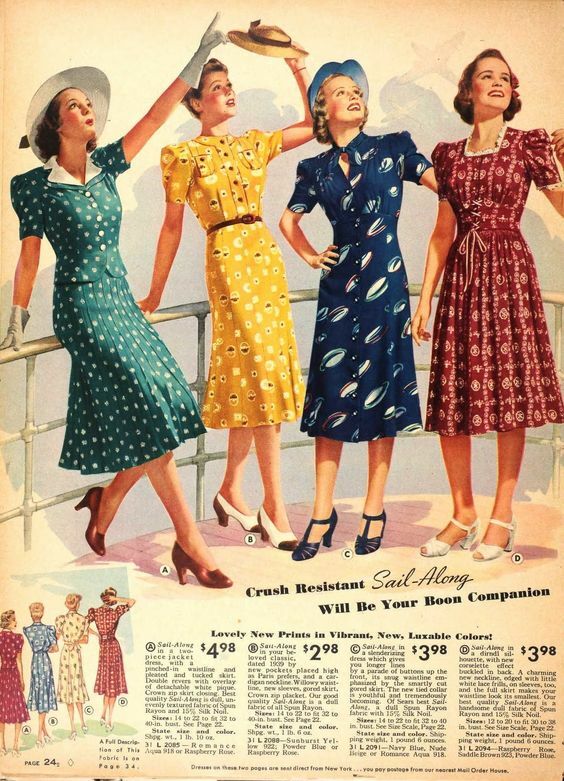 The square neckline is similar to the red dress in the far right of the second 1939 catalog. 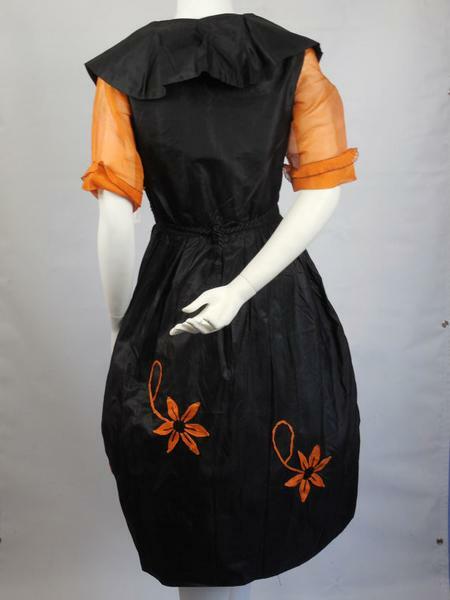 The overlay is most similar to the black dress in the first catalog page. 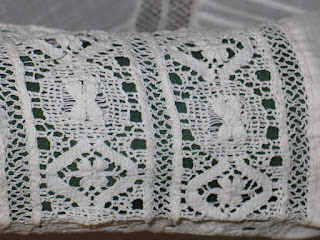 I love the look of netting over busy fabrics. 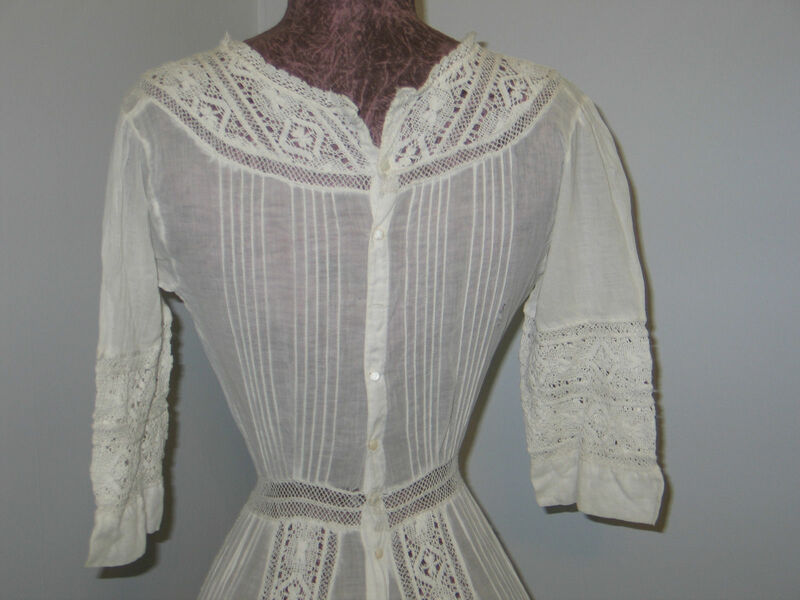 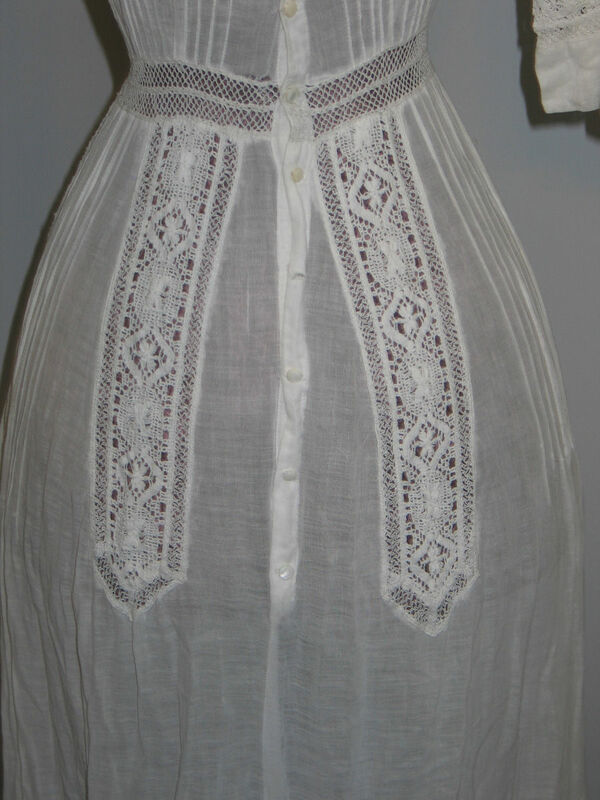 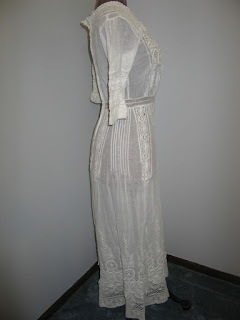 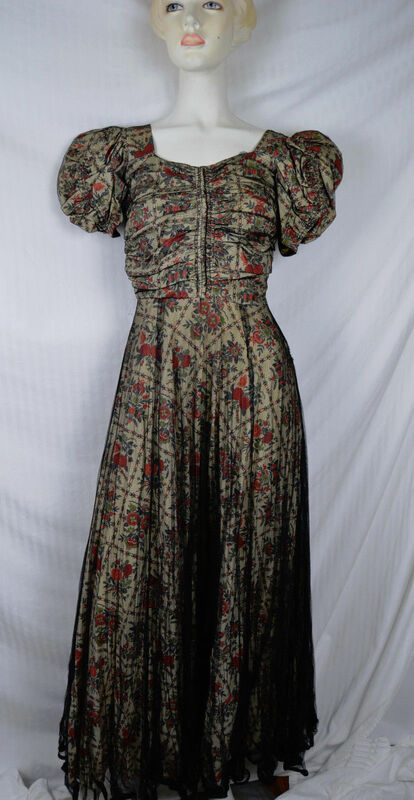 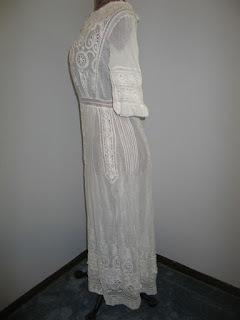 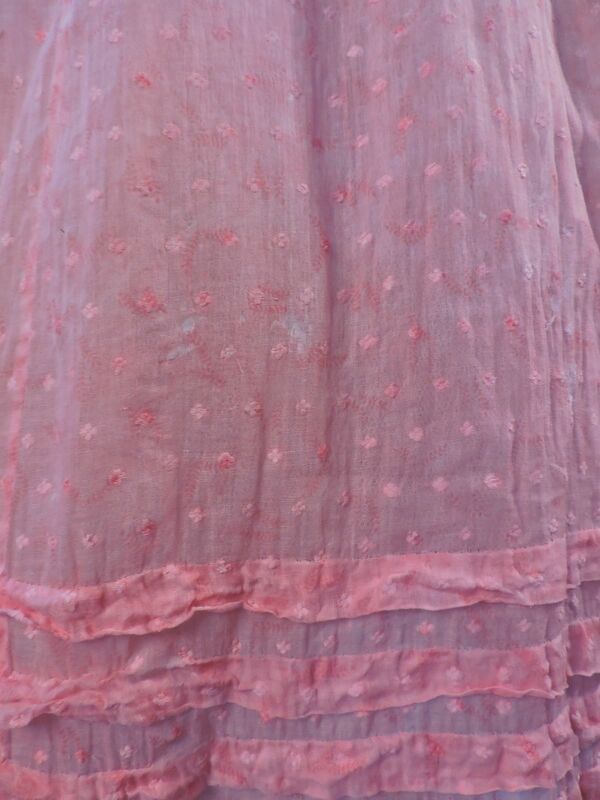 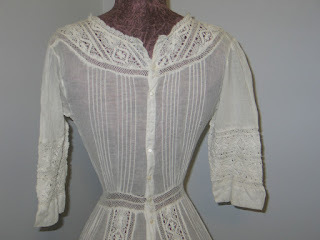 Beautiful Antique c1900 Victorian~Edwardian Day Tea Dress. 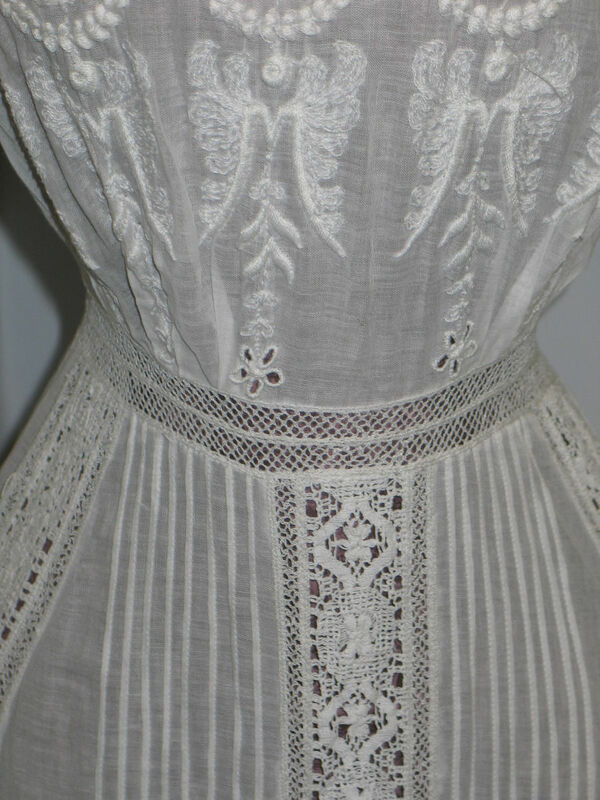 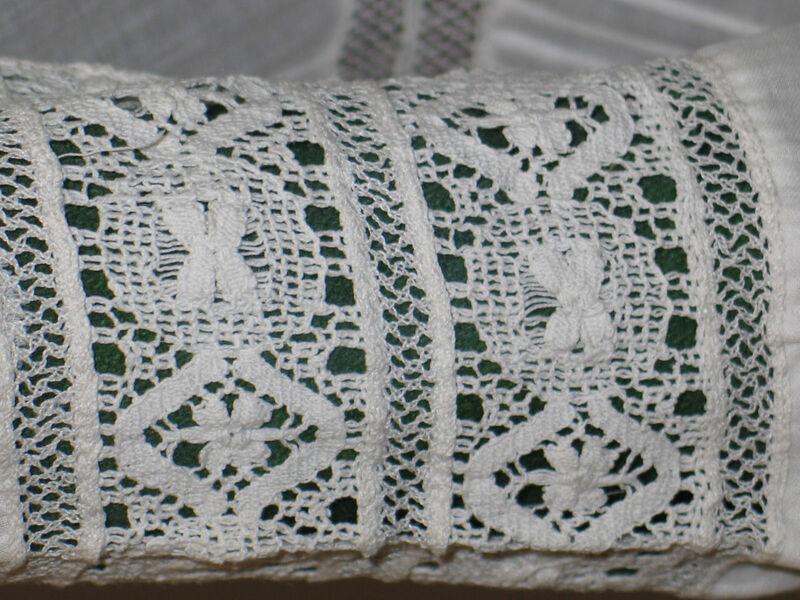 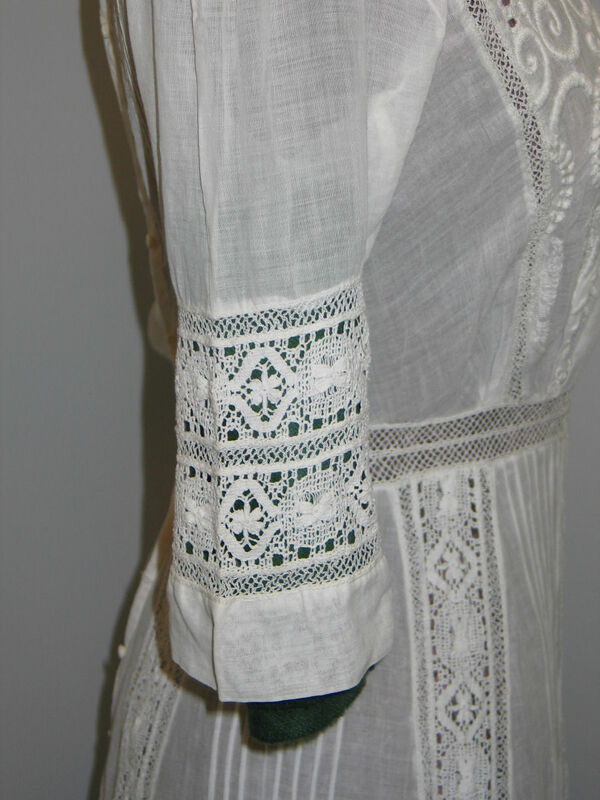 This lovely gem is made of a soft white cotton lawn adorned with very fine hand embroidery flowers and delicate broiderie anglais lace and bobbin lace trim and inserts, very fine hand done pintucks. 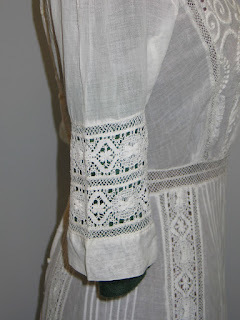 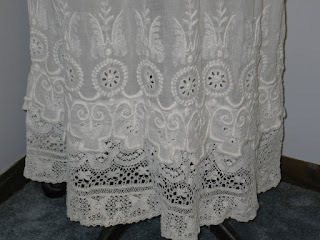 The skirt features 2 layers of lace, the top/upper layer is hand embroidered broiderie anglaise lace and the bottom/lower layer features beautiful bobbin lace. The dress closes in the back with MOP buttons (there are 3 missing buttons). It is in excellent wearable~displayable condition. 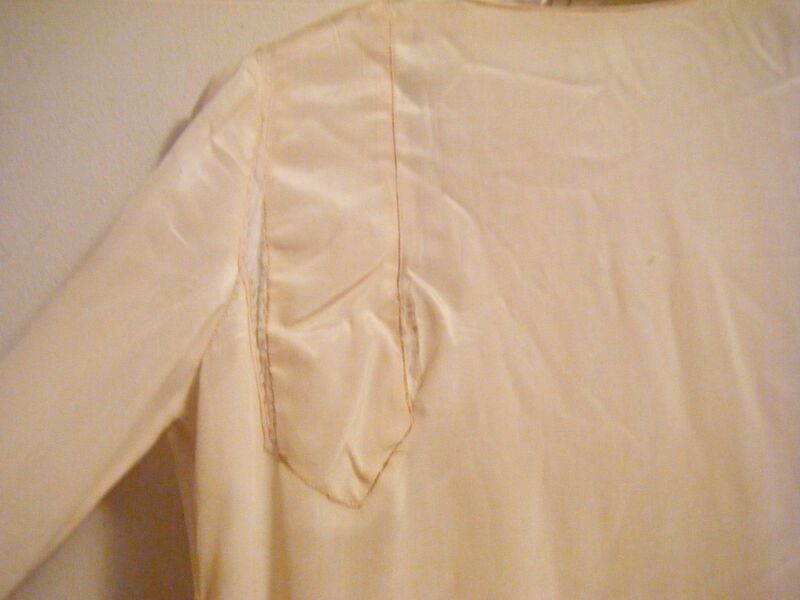 There is a very well done repair on the back that is not very noticeable. 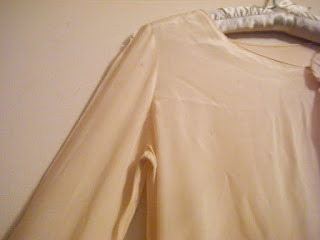 (as shown). 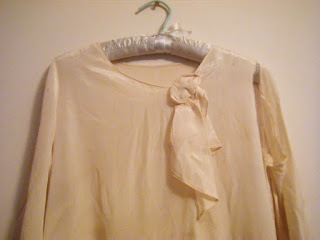 I have not laundered this lovely gem. 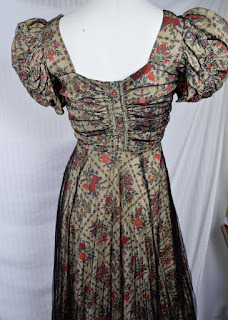 The photos just do not capture the true charm of this lovely gem. 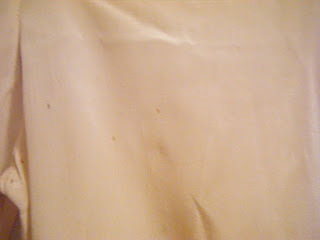 I will be happy to supply additional photos upon request. I CAN TELL THAT THE GOWN WAS OVERDYED AT ONE TIME, CANNOT TELL WHEN. 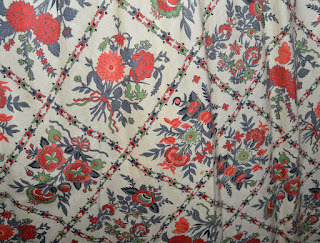 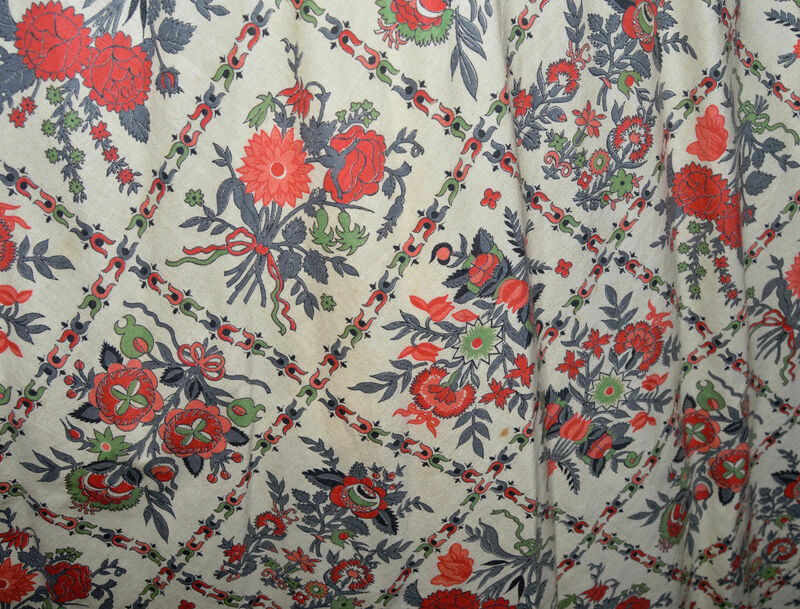 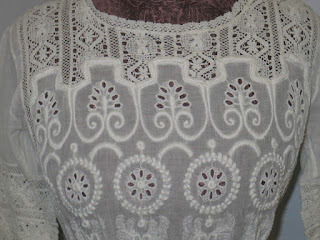 THE TELL TALE SIGNS ARE THE EMBROIDERED TRIMS AND THE LINEN WAISTLINE. 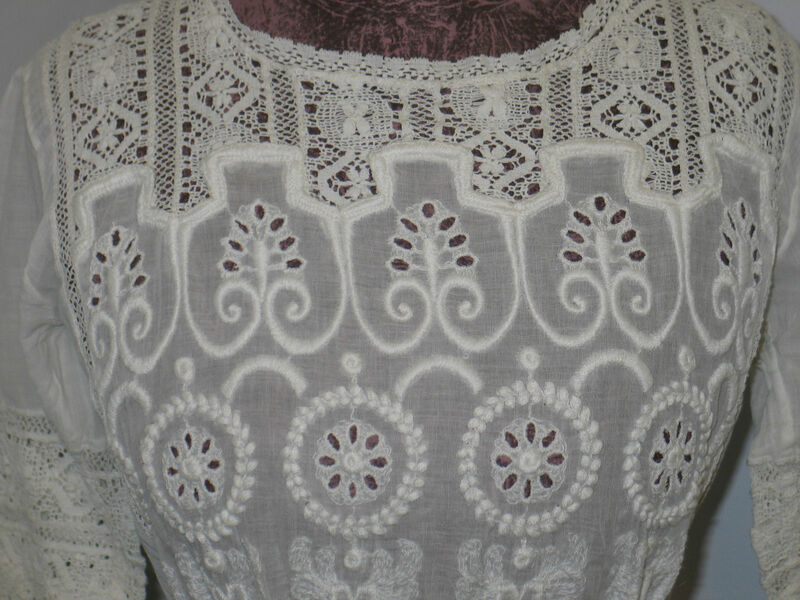 COLOR IS COMPLETELY EVEN AND HARD TO TELL, I WOULD ADD WHITE LACE OR EYELET TO OFFSET, REMOVING OR ADDING TO THE TRIM OF THE COLLAR AND CUFFS. 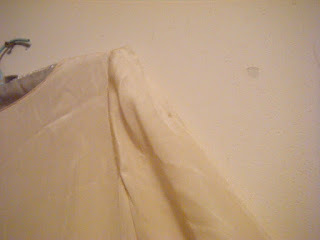 ONE THUMBPRINT OF A WHITE SPOT IS AT THE SIDE FRONT SKIRTING. 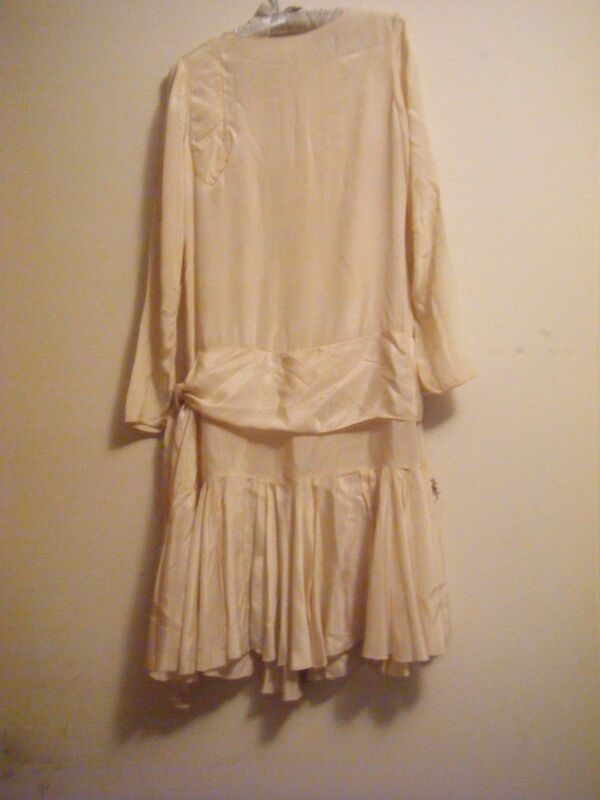 So...it's displayed horribly. 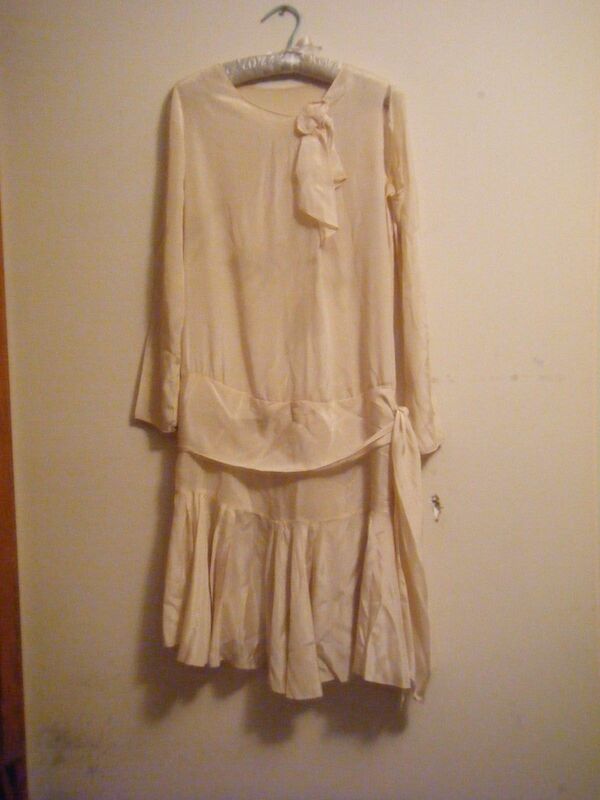 I mean, I'm not even sure what the seller was trying to do. First, it shouldn't be displayed over a crinoline. That went out of fashion about 30/40 years before this was popular. Second, the shirt tails should be tucked in. 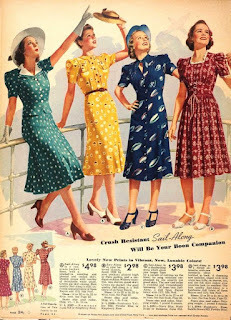 I have no idea why they aren't. 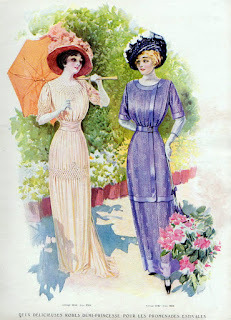 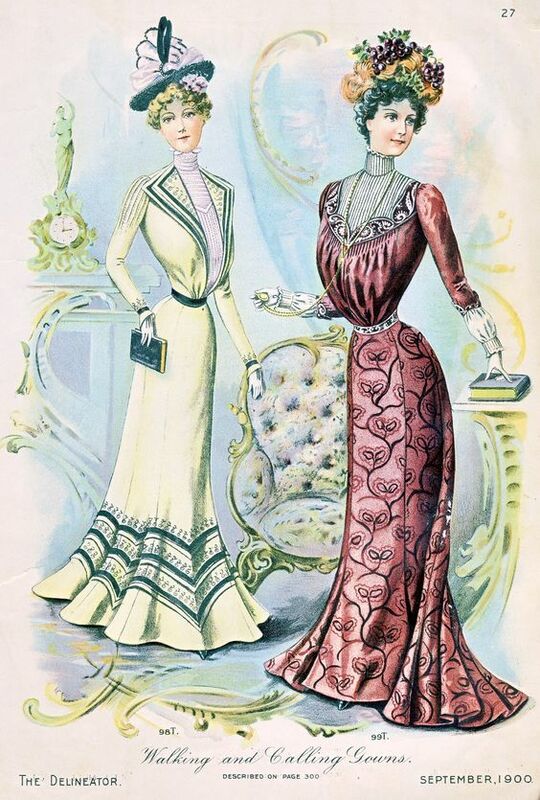 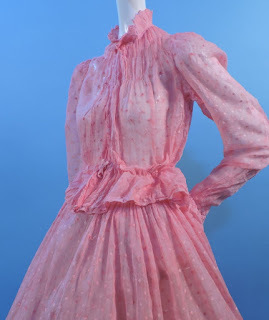 It's supposed to fall more like the pink dress in the above fashion plate.